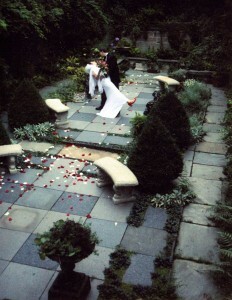 Say your vows in the Museum’s elegant Greek Revival Double Parlor or lushly planted 19th-Century “Secret” Garden. The house & garden are yours for 2 hours (including set-up and clean-up). Including guests, bride/groom, and vendors. Availability. The museum is open to the public Fridays, Saturdays, and Sundays, 12 to 5pm. Whenever possible, rentals must take place outside regular museum hours. We prefer not to close the museum, but can consider it under certain circumstances, at an additional rental fee. Pre- or Post-Ceremony Toast. Bring your own drinks and light hors d’oeuvres and enjoy an extra hour with your guests in the Garden or cozy Period Kitchen or Family Room. Rental fees for all receptions are determined on a case-by-case basis, depending on the overall complexity of your event (e.g., number of guests, length of the event, space(s) used, number of vendors/rentals). Prices below are guidelines only, based on a 3-hour event. Ceremony in Greek Revival Double Parlor or Garden. Reception in Period Kitchen, Family Room, or Garden. Space only, 3 Hours, including set-up and clean-up. The museum can recommend caterers. Ceremony in Greek Revival Double Parlors or the Garden. Dinner in Double Parlors, Period Kitchen, Family Room, or Garden. Rental fees for all receptions are determined on a case-by-case basis, depending on the overall complexity of your event (e.g. number of guests, length of the event, amount of set-up prior to the event, number of vendors, rentals, etc.). Rental fees for Ceremony & Seated Dinner in the Double Parlor start at $400 per person, max. 20 guests. Space only. Museum can recommend caterers. 212-777-1089 or email nyc1832@merchantshouse.org. Please include as many details as possible about your plans. Restrictions apply. See our Rental Guidelines for details.